Heated Seats, Navigation, Sunroof, Panoramic Roof, Turbo Charged. A 220 trim, Night Black exterior and Neva Grey/Black MB-Tex interior. SEE MORE! KEY FEATURES INCLUDE Sunroof, Panoramic Roof, Back-Up Camera, Turbocharged, iPod/MP3 Input. MP3 Player, Child Safety Locks, Steering Wheel Controls, Heated Mirrors, Electronic Stability Control. OPTION PACKAGES AMG LINE chrome-finish diamond-block grille and brakes w/perforated front brake discs, AMG Body Styling, AMG Line Sport Steering Wheel, AMG Floor Mats, Galvanized Shift Paddles, Sport Seats w/Separate Headrests, AMG Line Code, Black Headliner, PREMIUM PACKAGE 10.25 Digital Instrument Cluster Display, KEYLESS-GO Package, KEYLESS-GO, HANDS-FREE ACCESS, Connect20, 10.25 Touchscreen Multimedia Display, Mirror Package, Auto-Dimming Rearview & Driver-Side Mirrors, Power Folding Side Mirrors, MULTIMEDIA PACKAGE Traffic Sign Assist, Augmented Video for Navigation, MB Navigation, Mercedes Me Essentials Package, Navigation Services, OTA Navigation Map Updates, HEAD-UP DISPLAY, BURMESTER SURROUND SOUND SYSTEM, HEATED FRONT SEATS, BLIND SPOT ASSIST exit warning assist, SIRIUSXM RADIO free trial period, GARAGE DOOR OPENER. Mercedes-Benz A 220 with Night Black exterior and Neva Grey/Black MB-Tex interior features a 4 Cylinder Engine with 188 HP at 5800 RPM*. EXPERTS CONCLUDE Great Gas Mileage: 35 MPG Hwy. 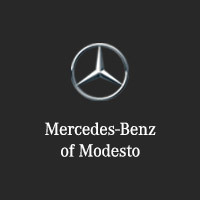 OUR OFFERINGS Mercedes-Benz of Modesto in Modesto, CA treats the needs of each individual customer with paramount concern. We know that you have high expectations Horsepower calculations based on trim engine configuration. Fuel economy calculations based on original manufacturer data for trim engine configuration. Please confirm the accuracy of the included equipment by calling us prior to purchase.Heated Seats, Navigation, Sunroof, Panoramic Roof, Turbo Charged. A 220 trim, Night Black exterior and Neva Grey/Black MB-Tex interior. SEE MORE!